During the Holidays I wanted to start a new tradition of making cookies with my children on Christmas Eve. Initially, I planned to make peanut butter and/or chocolate chip cookies, but as I was doing inventory in my pantry I noticed I had some cashew butter. My mind started racing; I ran to Pinterest for a cashew cookie recipe, but found none that excited me. I did find a peanut butter cookie recipe that sounded delicious, so I re-created it, to use my cashew butter, to veganize it, and to add my own creative touch to it! This cookie recipe can be used anytime of the year and they're easy to make. Enjoy and let me know what you think! Cream together the cashew butter, vegan butter, sugar in the raw and brown sugar until blended. Add in the egg-replacer, almond milk, and vanilla. 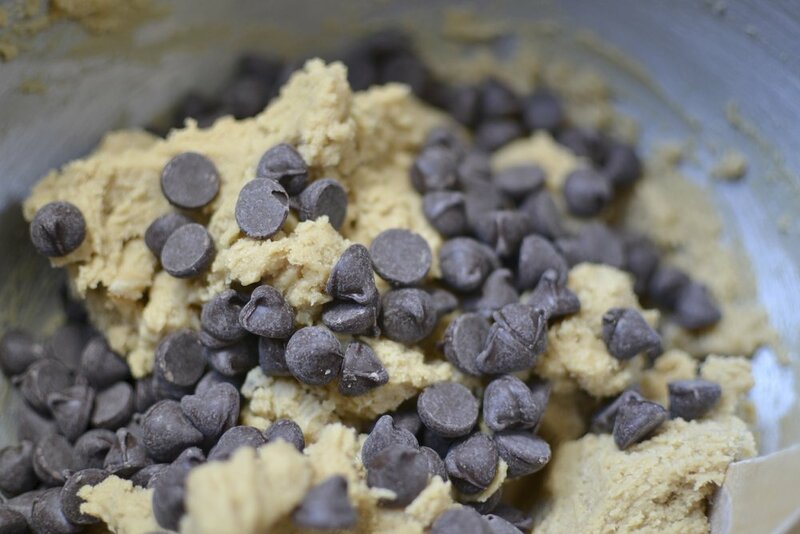 Combine the garbanzo bean flour, baking powder and sea salt in a separate bowl. Add flour mixture to the cashew butter mixture and mix together. Stir in the vegan semi-sweet chocolate chips (optional). Scoop tablespoonfuls of dough and roll into balls. Place cookies 2 inches apart on ungreased cookie sheets (I used parchment paper on top of my darker cookie sheet). Press each cookie ball once with a fork. Bake for 8-10 minutes at 375. Do not overcook! These cookies are much better soft and just barely cooked all the way through! Enjoy! *Side note: I used Earth Balance for vegan butter, Ener-g as my egg-replacer, and Whole Foods 365 brand of vegan chocolate chips. If you're okay with eating soy Trader Joe's has non-dairy chocolate chips, but they do contain soy.